Chaat Masala is a spice mix having sweet and sour taste. It gives that tangy taste to salads, sandwiches, fresh fruits, finger chips fast food snacks etc. 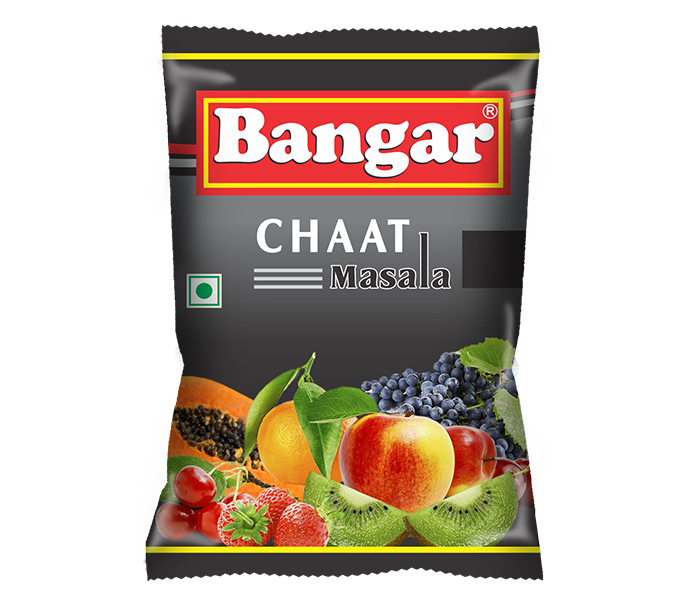 Bangar Chaat Masala is a perfect racy blend having finest combination spices to give a sweet, sour and tangy taste. Just sprinkle and enjoy the finger licking exciting taste. To sprinkle on Salads, Sandwiches, fresh frits, finger chips, dahi wada, wafers, and fast food snacks. Coriander,Cumin,Nutmeg,Kachri,Mint leaf,Pepper long, Pomegranate seeds, Black Salt, Rock Salt, Malic Acid, Dry Ginger, Dry Mango, Black Pepper, Asafoetida, Bishops weed, Caraway, Clove & Chilli. Receipe : Cut and and peel 4 potatoes into thick fingers. Heat oil on medium flame and deep fry the potato fingers till they are golden brown and cooked. Drain on absorbent paper. Add the potatoes to 2 finely chopped green chillies and coriander, add 1 tbsp Bangar Chaat Masala, mix well and keep aside. Head 2 tbsp mustard oil in a pan add a pinch of asafoetida and stir for 10 sec. add 1 cup chopped capsicum and saute for 2-3 min. add the potato mixture and toss gently for 2-3 minutes. Serve hot.